From Pastor to a Psych Ward: Recovery From a Suicide Attempt is Possible is a series of essays compiled from author Steve Austin’s blog. The book opens with an endearing dedication to Steve’s Aunt Missy, whose suicide when he was fourteen clearly affected him as a teen. From there, it addresses the abuse Steve suffered at the hands of a neighborhood boy. There isn’t much detail about the abuse, but detail here isn’t necessary. It’s clear throughout that the abuse was a core wound which affected Steve’s perceptions and the choices he would make as he grew older. The depiction of the abuse serves to help the reader understand the inner workings of Steve’s mind as he felt his whole world crumble down around him, as he spiraled into an abyss that is difficult – but not impossible – to climb out of. One essay features the voice of his wife, to whom Steve gives credit for standing by him and helping to see him out of that dark abyss of depression. I appreciated, as a reader, having a more complete picture of Steve’s life and the support system he had as he worked toward wholeness. The essays were at times hard to read because of their intense content, but more often than not, they were also injected with humor, positivity, and a steep belief in the power of maintaining a deep connection to God. For the reader who leans toward a Christian perspective, the book reads as an inspirational story about recovering from darkness and finding one’s way back to light. Steve touches on religion with a down-to-earth perspective I appreciated. He addresses the importance of self-care and why folks who struggle with depression “don’t owe anyone an apology” for taking medication that helps them get through their days. He talks about why letting go is sometimes necessary for your own personal sanity, but reveals that letting go doesn’t always mean burning bridges. I found the book an inspirational, easy read. At only forty-eight pages, it’s short and sweet. I breezed through the book and actually wished it had been longer, so I could get to know Steve (and the other authors) better. Most of the essays were less than two pages, which was nice, because it was easy to keep track of where I was in the book when I went back to read it. This book is for you if you’ve been affected by suicide, depression, abuse, or sexual violence. It may be triggering for readers because of the depictions of abuse and suicidal ideation, but it doesn’t linger long in the dark spots. The book provides an insightful look at what leads some of us to ponder and attempt suicide, and I recommend it for anyone who is looking to learn more about the feelings behind depression, anxiety, and suicidal ideation. 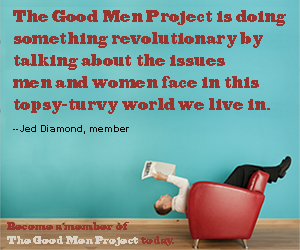 Juana is ecstatic to contribute to the conversation at The Good Men Project. Passionate about social change, she has a habit of wanting to talk about things people don’t like to talk about, and candidly addresses social issues through the lens of her direct experience healing from trauma. She also enjoys writing fiction, talking about Middle Eastern dance, baking, and trying to garden even though she has a pretty black thumb. Thanks for such an honest and thoughtful review of my book! I appreciate this very much. You’re very welcome! I enjoyed the read. Thanks for sharing your story with me and others.